If you know me personally, then you know that I recently made the switch to full-time self-employment. I never even thought that this would be possible for myself, and without starting a side business in the first place, I do not think that any of this would have ever happened. There are many positives of starting a side business, and today I get to tell you those reasons. One of the reasons that I buckled down and really started to focus on my side business was so that I could pay off my $40,000 in student loans that I accrued after I finished my third degree. The $40,000 in student loan debt was a really frightening number to think about, and I know that if I only worked my day job that it would take quite a long time to pay it off. I have heard stories of people taking decades to pay off their student loans, and I did not want to be one of those people with student loan debt hanging out my head when my future children go to college. I wanted my student loan debt to be eliminated as soon as possible. That is when I decided that I needed to work at least part-time doing something in order to pay off my student loan debt more quickly. With my side business, I was able to pay off my student loans very quickly. Not everyone loves their day job. And I was one of those people. My side business first started as a hobby, and grew from there. My side business started as an outlet where I could voice my opinion and learn from the community that I was a part in. It was a really great thing to have since I did not enjoy my day job. Eventually, I knew that I would rather pursue my passionate side business rather than my boring day job. Starting my business first as a side business was a great idea for myself. I was able to not fully rely on the side business income since I still had my day job income. This allowed me to completely test the ropes of having my own business, but not having to be stressed out about the financial aspects of having your own business from day one since I already had a stable job that provided benefits. I was able to see if a side business was for me or not. If I decided it wasn’t for me, it wouldn’t have been a huge deal since I still had my day job. Due to starting my business first on a part-time basis, I was able to slowly make the transition to making my business a full-time venture. I think that this method helped me a lot, as I was able to grow with the business and learn from my mistakes without it hurting me too much. 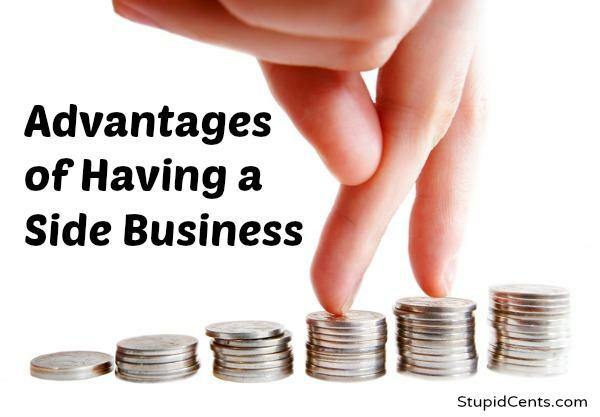 A big positive of starting a side business is that it can help you become more diversified. Everyone remembers the down economy of the past few years, and a side business can help get you through that in the form of extra money. Not relying on just one form of income can be a lifesaver. Have you started your own side business? Why or why not? A side business is never a bad idea if you have the time for it! It’s a great source of income. I also can second the passions aspect – I teach violin lessons on the side of my standard jobs and it helps me do something I love and gets me a second income! Congrats on making the move to 100% self-employment! I wish you all the best! What are your plans to grown your side business now that it is your full time business? Or do you plan on starting a different side business as well? Thanks Brent! I have many plans to grow my business 🙂 I have so many that it’s hard to keep track of everything!